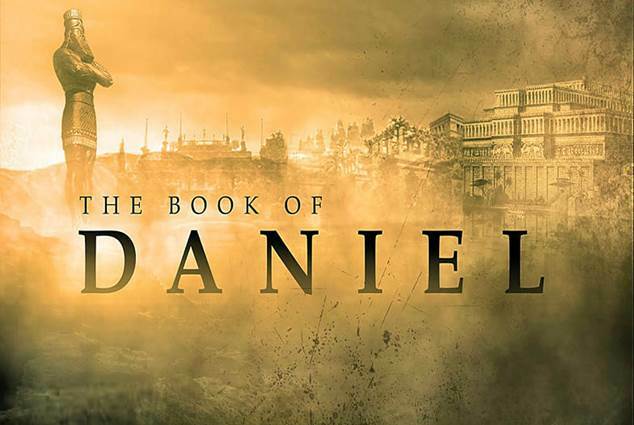 were foretold 4,500, 3500, 2,500 & 2,000 years before they happened & are happening. These events have been planned by positive & negative entities, whose lineages have prevailed thousands of years to date, their generational determinations are on the pinnacle of finality. levels the perspective - 1st discard the obvious junk. victorious for the good side. forecasts of a probable tsunami? by peacefully resting in the Spirit of truth. Many more are pre-occupied sustaining their lives. also, overly distracted by entertainment & recreation. are changing local, national & international foundations. will wake up to a nightmare. well beyond required scientific parameters. Written in the 6th Century BC ! collectively referred to as Judea. warned Judea to stop living immorally. conquered Judea 606 BC, and finally Jerusalem 586 BC. amongst an immoral majority generation. Most BIBLE-scripture references are in this COLOR. his feet part of iron and part of clay. (5) a stone (Jesus THE CHRIST) was cut out without hands, which smote the image upon his feet that were of iron and clay, and brake them to pieces. over other kings/countries = an EMPIRE. :38 ... Thou (King Nebuchadnezzar) art this head of gold. 200 years before it happened. the goat had a notable horn between his eyes. are the kings of Media and Persia. the great horn that is between his eyes is the first king. but not in his power (not in his sons). & grew quickly to rule the civilized world of that time. 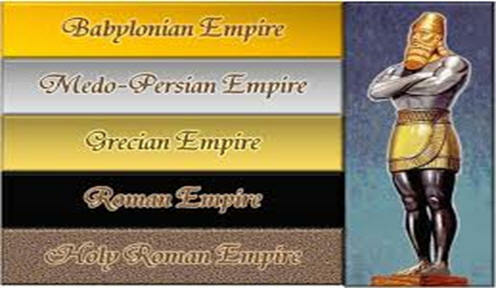 Rome that was & still is the 4th Empire (the legs of iron). However, Alexander's effective settlement of Greek colonies, secured the spread of the Greek culture, even then greatly influencing Roman culture, though Rome overpowered them militarily. However, Greek continued to be the International language of the time, as English is today. Greek culture influences most of western culture till today. dominates the whole earth to this day. an International not national entity. as iron that breaketh all these, shall it break in pieces and bruise. its cat of 9 tails & crucifixes. mixed with clay (religious-social-political nature of man). the Roman Empire began transitioning from a military empire into, by the 7th century, what became the Roman Catholic Church - a religious-political institution, with military influence that perpetuated numerous satellite private-secretive groups that infiltrated any & all influential aspects of society, starting with the then present monarchs. Eventually, Infiltrating the world, via secret societies, promoting social-religious-political-educational-cultural propaganda ... leveraging DIVERSITY … assisted by ... military-by-proxy ... would prove to be more expedient. However, such diversity would still foster opposing perspectives that would not always see eye-to-eye … thus division. :42 And as the (10) toes of the feet were part of iron, and part of clay, so the kingdom shall be partly strong, and partly broken. some nations would be strong & some weak. divided the world into 10 regions - the 10 toes. most common folk do not know this important fact. NOT their own supposed homeland. :43 And whereas thou sawest iron mixed with miry clay, they shall mingle themselves with the seed of men: but they shall not cleave one to another, even as iron is not mixed with clay. at the mid & lower levels of the populous. thereby making themselves vulnerable to the new power structure. The Roman Empire never ended. when Jesus establishes His eternal Kingdom. (refers to Jesus Christ the Messiah). thus have continued to be persecuted by Rome to this day. In fact, "doctrine" is becoming a bad word. morphed into the Roman Catholic Church. headquarters of the Eastern Orthodox Church). western culture, ultimately the world. to a lesser extent the world . the official title of the head of the Roman Catholic Church. Pope Celestine I (422-432 AD). As of 606 AD the this became perpetual. conquered Constantinople in the mid 1500's AD. though inhibited by Islam & further, by Socialism. from the Vatican, eventually controlled the kings of Europe. The work of man, the plan of Lucifer. with a polluted version of God's Word. which are not subject to the Countries they reside in. & much of the world. 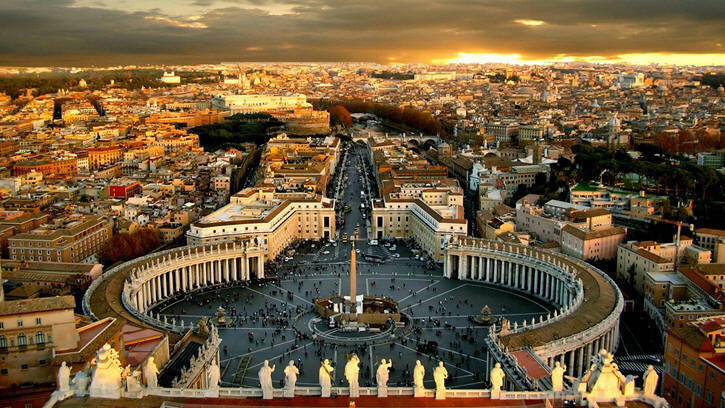 Vatican city, is the religious-political center. Inner London city, is the economic-political center. Washington DC, is the military-political center. that has been slowly but persistently infiltrating the world. ALL ROADS LEADS TO ROME. gaining Global influence in the last 400 years. Clay - symbolizes people-issues (religious-social-political factions). Scripturally – man was & is made from earth, clay. for obediently reading God’s word. by war, poison & assassination. which encourages all to read His word !!! ... the recipe for a successful life. unless contrary to God's word. at times even siding with Christians. was the Vatican counter to Protestantism. … realized Vatican practices were contrary to scripture. OBEY GOD'S WORD ABOVE ALL ELSE !!! then each other & authorities. for their own consciences' sake … before God. causing the spark to become a flame. as an invitation to openly debate Vatican vs Biblical principles. & Europe in 6 weeks. the most sold book in history. The PROTESTANT REFORMATION was for a time unstoppable. free from the heretical Vatican-Popes. the Vatican counter to Protestantism. rather, to affect social changes across all cultures. religions, healthcare, media, corporations, governments, etc. … etc. … to gain world dominance. an unquenchable desire for world dominance. They were banned from ~ 85 nations. but we will return as eagles. religion, philosophy & secret societies. as we are often told, "it is all about the money." since their youth, through media & education. … yet, is trillions of dollars in debt. is worth MANY Trillions of dollars. SO ... who is really more influential ?… & how? Foundations & numerous secret societies. bankers for the Vatican, home of the Jesuits. are Luciferian, Satanic, Devil Worshippers. sent a letter by horseman to Paris. before he got out of Bavaria. & turned them over to the appropriate authorities. Illuminati lodges, homes & a castle were searched. The United Nations is in New York, USA. 1786 the Illuminati was banned from Bavaria, Germany. WWI was to be Germany against Britain. & become a Communist Nation. Done. WW2 was to be Germany against Britain & the USA. Russia was to become more powerful. Israel was to become a nation again. Done. with other nations becoming involved. Clearly, in process. 1- Russia became a more global prominent nation. 2- The USA became a more global prominent nation. 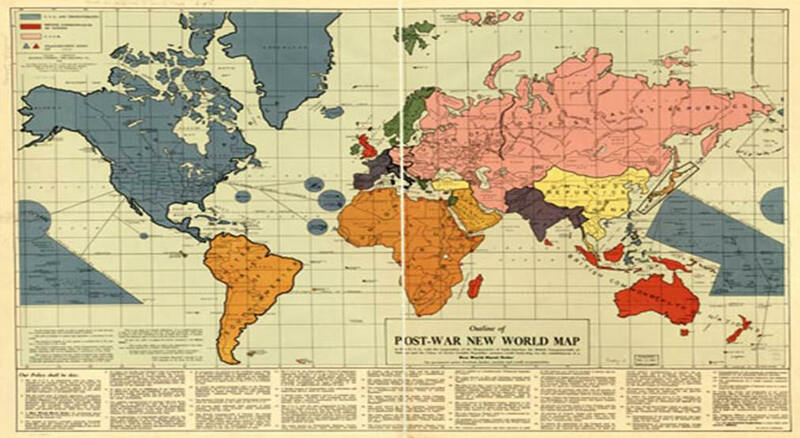 3- Russia & USA became globally opposing dominant nations. as intended by Masonic Albert Pike (1880’s). To initiate Global Government structure, for World control. in 1948, Israel became a Sovereign Nation again. of the Northern Kingdom of Israel. shall serve the king of Babylon seventy years. Chaldeans, and will make it perpetual desolations. 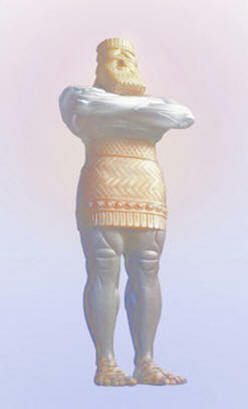 539 BC Cyrus Conquered Babylon. in causing you to return to this place. 538 BC Cyrus decreed that the Jews could return to there homeland & rebuild Jerusalem & the Temple. back in their homeland, 536 BC. God also promised to bring Israel back into their land & make them a nation again … never to be conquered or dispersed again as one nation … never to be divided again … He would defend them from their enemies. ALL HAS, IS & WILL HAPPEN !!! never to be removed again. Israel was declared a sovereign nation. and become a nation again. as declared by the WORD OF GOD. Israel becoming a nation again after being dispersed for 2500 years is a huge miracle in & of itself without any of these other amazing calculated incidents that are far beyond happenstance! 538 BC, Cyrus wrote the decree permitting the Jews to return to their homeland to rebuild Jerusalem & the Temple. 430 yrs - 70 = 360 years of retribution remaining. 7 x 360 yrs = 2520 years retribution remaining. Arabs to get their land back after WW1. they each own what is presently Israel. To eventually (SOON), culminate in WW3 / Armageddon. that will ultimately be ETERNAL. for the 1st time since 606 BC. 606 BC Babylonian conquest began. 586 BC, Jerusalem fell & the temple was destroyed. 1948 May 15th, Israel became a nation again. June 5th-10th was during the 20th year. John Revelations 13 & 19:19-20.
if God permits Malachy to be correct. about the predicted final Pope. thus far, hence appearing to have merit. The Vatican-Popes are closely associated with the United Nations (UN). The Jesuit's have infiltrated the governments of the countries of the world, which are progressively signing their rights over to the United Nations. Most nations, including the USA, are in the process of having most of their military deployed to other countries, while foreign militaries inhabit their homeland, all under United Nations influence. Think about that for just a moment ... it is genius. How can you defend your homeland, when you are not there. Americans feel secure, believing their military would not obey orders to shoot their own people ... SO WHAT … if their troops are overseas & foreign visiting troops are under UN orders. Join this, with fact that government & politicians, agree with public concerns, until elected ... then do contrary. Foreign troops will shoot US domestic civilians. in unification of the world. & global authority under 1 dictator. & the United Nations adopted the plan ~ 1970. The islands of the seas, for the most part, fit in with the closest region. Antichrist-Beast, as a global authority. Babylon is the predecessor of all pagan religions & cults globally. AKA Ashtoreth (queen of heaven) & Baal (sun god). which goes on to conclude the end of time. while the USA is at war with radical Islam. a conflict of American interest. implementation was intended to begin by December 31, 2017. With Trump it has not happened ... but it will happen with or without him ... soon!!! :2 With whom the kings of the earth have committed fornication (corruption), and the peoples of the earth have been made drunk (blind) with the wine of her fornication(deception). :9 And here is the mind which hath wisdom. known as the CITY OF 7 HILLS. over the kings of the earth. over 10 Global Regions in these days. in elections contrived by the upper-echelon. SO THEY THINK THEY ARE FREE. yet, have a similar effect. The final global accumulative effect of all 4 empires shall be trashed. having a collective role in the final global authority, so arrogant they believe they can defeat God Jesus at Armageddon.